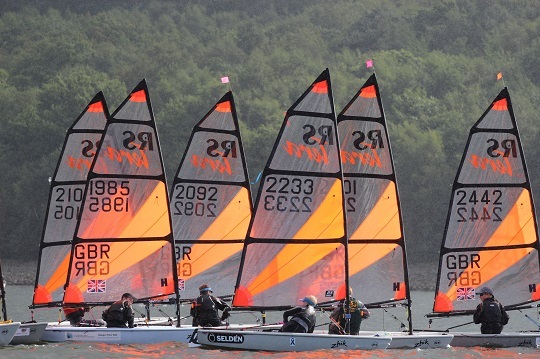 Seventy Seven Boats from clubs as far afield as Castle Cove and the Isle of Man entered for the RS Tera Inland Championships sponsored by insurance4dinghies and Zhik at Bewl Valley Sailing Club over the weekend of 7th and 8th September. The first race on Saturday was a shifty and gusty affair, with the race team, guided by ex-Commodore Jeff Warley setting a course in the South Westerly breeze. First away were the PRO fleet and after some extremely close racing Sam Doble-Thomson of Aldeburgh YCset his marker down for the rest of the regatta, Sam was followed home by Alex Butler of Hayling Island SC and local sailor Matthew Caiger of Bewl Valley SC third. In race 2 we saw another winner and this time by a good margin, Ana Patterson of Ripon SC, Ana was followed home by Sam and then Matthew. 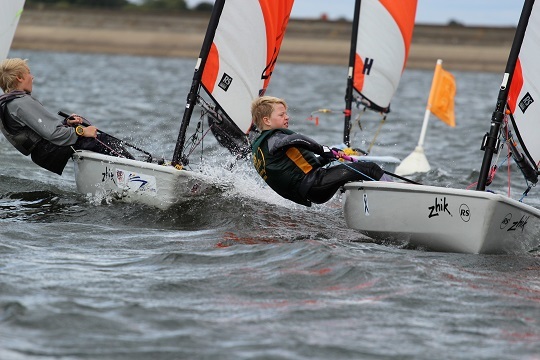 The Sport fleet got away and was hotly contested with Henry Rastrick of Ripon sailing Club taking line honours followed closely by Harrison Pye of Draycote Water Sailing Club and Ben Batchelor from the Isle of Man. In the PRO fleet Ffinlo Wright from the Isle of Man stamped his authority on race 3 taking a good win, followed home by Daniel Lewis of Draycote Water SC and Sam D-T. In race 4 we saw yet another race winner and a Hayling Island SC 1,2,3: Henry Jameson stepping up to the PRO rig for the first time, followed by Alex and then Yann Bracegirdle. In the SPORT fleet a pattern was starting to emerge in race 3 with Harrison taking the win followed by Ben and then Jack. In race 4 Jack stormed to victory, followed by Harrison, then a new face in the top 3, Roscoe Martin of Ogston SC. At the end of day 1, the PRO fleet was lead by Sam, then Alex and Henry, with 4 different race winners, day 2 was going to be very interesting. The Sport fleet was lead by Jack then Ben B and Harrison, again 4 different race winners meant that it was all to play for on Sunday. An early finish to the day, allowed all the sailors to catch up with old friends and make new ones, loads of families took advantage of free camping at Bewl for the weekend. Sunday dawned with a decreased breeze but from the same direction, a very different challenge for the race team, it was very shifty and we had rain, sun, rain, sun.........you will see the pattern. In the PRO fleet Alistair Scott of Ripon SC delivered 2 straight wins, leaving the others in his wake, in race 5 he was followed by Alex, the Tom Goacher of Lymington Town SC, in race 6 it was Archie Hainsworth of Alton Water SC another sailor stepping up to the PRO for the first time and Matthew back in the top 3. In the SPORTS, it was Matt Smith of winning race 5, followed home by Ben B and Roscoe, race 6 was taken by Maddie Wylie of Ripon SC, with Ben H-P and Jack following her home. After lunch ashore it was time to hit the water and decide the Championships, both were still up for grabs, it could have gone to a number of sailors in each fleet. The PRO’s again started first, with another winner, Daniel who was closely followed by Tom and Archie, this meant that going into the last race, technically it was between Alex, Sam, Henry and Matthew who could win the title. In the SPORTS, Harrison took his second win of the weekend, followed by Andrew Frost of Sutton Bingham SC and Henry Collison of Royal Lymington YC, meant that going into the last race any one of 5 sailors could technically take the title, Jack, Ben B, Henry R, Harrison and Ben H-P. The last race in the PRO’s was a tight tactical battle, with shift management being the order of play particularly up the first beat, In the end the race was won by Archie who had had a great day, followed by Ffinlo and then Alex who had done enough to secure the title, with Sam in 2nd and Henry J in third. The last race in the SPORT’s was equally tight, In the end the race was won by Jack done enough to secure the title, with Ossian Bracegirdle of Hayling Island SC and Roscoe following him home, overall it was Jack for the 2nd year running, followed by Ben B and Harrison. The competition in the RS Tera Fleet is very tight and provides exciting racing, with 7 different race winners in the PRO, with the champion not taking a win and 6 different race winners in the SPORT, the future looks bright. The RS Tera Class Association would like to thank the members and staff of Bewl Valley SC, particularly Jeff and Audrey Warley who were simply magnificent, nothing was too much trouble. Thanks must also go to event sponsors insurance4 dinghies and Zhik, without whom we would not be fortunate enough to be able to hold such great events. At the event the Class Association along with Mark of Funky Monkey Boatnames, sold ‘BART’ ribbon stickers to competitors and their parents to support the Andrew Simpson Sailing Foundation, raising £228.47, more stickers are to be sold, with an aim to raise a minimum of £500.